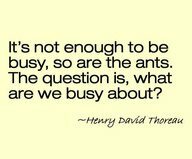 What Are We Busy About? | Lisa Endersby – Canadian professional in higher education working to pedestals and create paths for success. | Exploring the idea(l)s of success, learning, and teaching across the physical and virtual spaces of education. Special thanks to Teri Bump for tweeting the photo below that inspired this post. Having spent four out of 5 days last week at MBTI Certification training, I have come to experience what my fellow nerds might recognize as the post-professional development slump. While not as intense as the more contagious and widespread conference withdrawal, post-professional development slump is equally exhausting. I’ve found myself directionless, listless, coming down from the excitement of a structured series of exercises, lectures and mind blowing insights into human behaviour. (For those keeping track, your Nerd Alert alarms should be blaring at full volume). How fitting. To belabour my oft-used story metaphors, being busy might feel like frantically stitching together words to fill pages without buying into the plot. Apathy doesn’t always look like lethargy – movement helps distract from a lack of momentum. Going through the motions gives the illusion of progress at the expense of purpose. How often do we become addicted to action, the withdrawal symptoms often so hard to bear that we take any excuse to move, no matter the direction but with blinding speed. Can we stop numbing the pain of perceived stagnation with the constant push to catch up to people who aren’t even running the same race? What, exactly, are we busy about? What about you? Are you busy but bored? I think I am, and I don’t yet know what to do about it.